In this excellent video Dave Whitlock describes the proper fishing techniques for fishing from top to bottom using each of the four bass flies he tied in his companion videos - Fly Tying Bass Flies with Dave Whitlock. In this CD Larry describes his techniques for taking Northern Pike, Bass, and Bluegills. 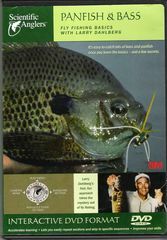 He also provides step-by-step instruction for tying two of his favoritie flies, knot tying and rigging instructions, and the proper techniques for handling a fly rod and reel. If you are new to the fly fishing game and casting is a proplem for you, Larry will help with easy casting exercises that you can do in your backyard to improve your casting skills. This is great instruction that is worth the price of the CD. Harry Murray knows Smallmouth Bass and how to take them with a fly rod. In this video Harry provides on-stream demonstrations of the tactics and techniques that he uses in all smallmouth bass fishing situations. In this action packed video Doug Swisher fishes a Montana high plains lake for Largemouth Bass. Doug shows you how to mend and strip properly, cast for distance, cover more water, and fish the edge -- the most important factor in locating bass. In Trouting Tactics for Panfish, well known author Jack Ellis (The Sunfishes and Bassin' With a Flyrod) demonstrates that you need not shift gears, either functionally or philosophically, when fly fishing for these warmwater species. Join Jack in this hour-long video as he fishes for bluegills and bass in his favorite East Texas stock tanks, farm ponds, and small lakes. You can order this video by calling SwiftWater Productions at (800)331-6483.